"Ignorance is an intellectual defect, imperfection, privation, or shortcoming." So begins James Ferrier's "The Agnoiology," the section of his treatise, The Institutes of Metaphysic (1854), in which he describes a theory of ignorance. In sympathy with Ferrier, Ignorance between knowing and not knowing concerns the nature of ignorance, its relationship to knowledge and its differentiation from merely not knowing. However, this book additionally considers how different forms of ignorance exert force within the creation and reception of art. These topics are explored through a range of essays drawn from contributors within the fields of philosophy, literary theory, and art criticism. Ignorance provides a reflection in negative to the normative structure of knowledge. It is the absence of knowledge that we "should have." This moral dimension can be seen in the persona, created by the medieval philosopher Nicholas of Cusa, of "the idiot," who is aware of his ignorance yet this awareness brings with it a humility, or the assumed ignorance within the Socratic dialogues. 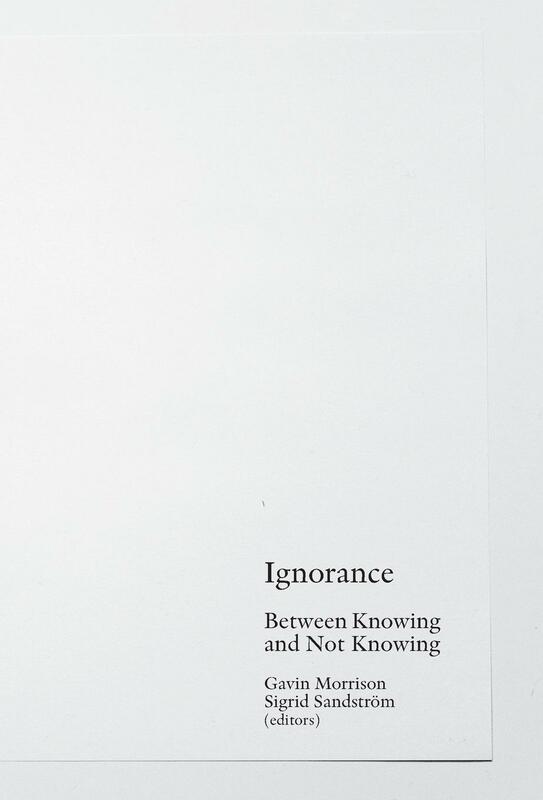 This book traces connections between ignorance within the philosophical realm - as both a strategy within discourse and as an object of inquiry - and how it occurs within art. Particular consideration is paid to art's utilization of ignorance as a means for establishing uncertainty and ambiguity. Within this publication ignorance is not solely understood as a state one seeks to escape from but rather, through its role within art and philosophy, it offers the potential to other forms of articulation and understanding. With contributions by: Andrew Bennett, Jonna Bornemark, Elinor Hållén, John Llewelyn, Gavin Morrison, Jeanine Oleson, Sigrid Sandström, Barry Schwabsky, and Kim West.